Developer Quote: "Use your mobile as a free personal trainer and fitness partner! 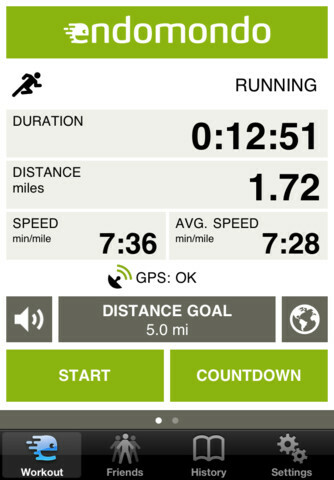 Endomondo Sports Tracker tracks your fitness - running, cycling, walking and any other distance based sport." Today’s review takes a look at Endomondo, so named because “Endo" is short for endorphins, which are released in the brain during sports. "Mondo" means world in Italian and Esperanto. In sum, Endomondo is a world of endorphins! Snappy! So, why should you give this app a whirl? Though I love competitive sports, I used to find running a little boring or a bit of a chore – one of those necessary evils required to offset the ill effects of a sedentary lifestyle. That all changed when I discovered Endomondo Sports Tracker. Now, I’m out pounding the streets three or four times a week come rain or shine, and have entered myself into a handful of local 10k races. Endomondo utilizes the GPS on your iPhone or iPad, and allows you to track your progress as you partake in whatever outdoor sports takes your fancy. 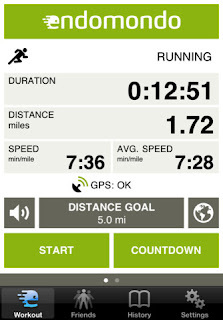 This app will track your distance, time, elevation, calories burnt, average speed, split times and far more. It will even factor in your heart rate, if you attach your iPhone to a suitable heart rate monitor. It will use your phone’s map to overlay your route and will show you which songs you were listening to at any point in your workout. In my opinion, however, the best function is the live update provided throughout your workout. Every kilometre or mile (depending on your preference), Endomondo’s pleasant female persona will inform you of your last kilometre/mile split and your total running time. Not only does this allow you to keep to a certain pace, but it allows you to challenge yourself. Another rather fun feature is the ‘pep talk’ function. 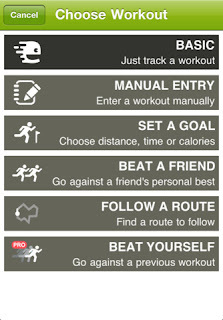 Endomondo is not only a personal trainer, but also a social networking tool. Once you have connected with your friends via endomondo.com, they can track your progress in real time and can offer support or harangue you from the side-lines. Their pearls of wisdom or jibes will then be relayed to you audibly as you run! Upload your completed workout to either Facebook or Twitter so you can revel in your successes or seek solace from your more understanding friends for your sub-par performances. In addition to being able to update your statuses, Endomondo will upload your workout data to its own website from which you can track your progress. The website is pretty intuitive and, with the aid of some handy graphs (in the PRO version), you’re able to see how many miles or kilometres you’ve run in the last week/month/year, your average pace, heart rate and speed, personal bests, how many calories you’ve burnt over a particular time frame. Perhaps, most importantly, you can view how many burgers this equates to! 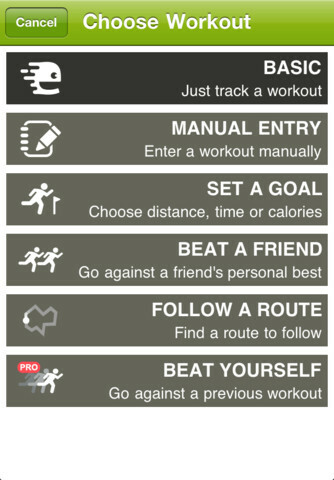 This health and fitness app is definitely fun, social and motivating as well! COOL CONCLUSION: "Endomondo enables you to keep fit and have fun while doing it, as well as offers detailed information allowing you to track your progress and that of your friends as you strive to cut minutes off your personal best!" (This post was prepared by Christine Jameson, a freelance writer from London who spends most of her time writing about how to help an alcoholic parent and other self help topics but as a huge sports fan has quickly become addicted to Endomondo).